Enjoy an evening of traditional Russian folk songs, music and dance in St. Petersburg. The evening’s performance features traditional melodies and dances from Russia's many regions. You will recognize some famous songs, which have become musical symbols of Russia. Russian folkloric dance is a mixture of traditional music and dance as performed in villages and towns, for local entertainment or in ceremonial situations, combined with both acrobatics, classical movements, formal ballet steps and modern dance. 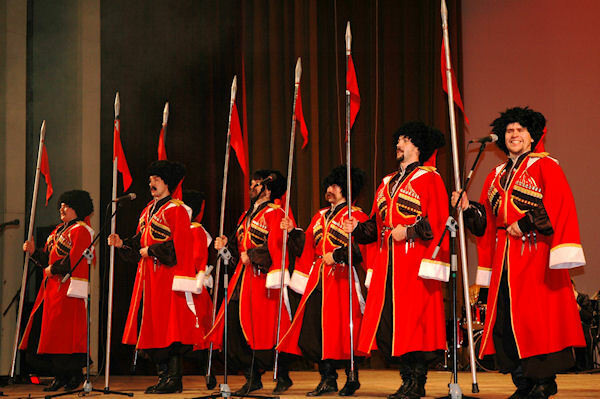 The program will include the famous Cossack dances as well. Russian refreshments, including champagne or vodka will be served during the intermission. Our Folkloric Evening Show has been specifically planned and scheduled so that all the passengers participating in our day tours, shall have sufficient time to relax, attend a dinner aboard the ship, and redress, if they so wish, after their day tour ended. LAST MINUTE CANCELLATIONS: Please, be informed that the tour company is individually purchasing each and every show ticket from the theater for each person who has ordered the show. As per international rules performance tickets are never refundable after purchased. The reason for the cancellation may be any imaginable reason, however, no reason will qualify for any preferential consideration. NOTE: This excursion is always scheduled for the first evening, or the evening of your ship’s arrival in St. Petersburg. There are no exceptions for this schedule.